I am hoping the last day of summer the clouds will break and we will get some sun to finally say goodbye to the official summer season. One child started back to school last week and my boys start tomorrow. Maybe this post will prove more appropriate as a back to school celebration post. I received several bags of Arbor Mist through a SheSpeaks campaign. I have never had a frozen wine cocktail before. The only type of wine cocktail I have tried is Sangria. Well, I am always up to try a new “Mommy Beverage” so I packed a few in the freezer. They need to freeze for 5 hours and then you just massage the bag and pour into a glass. Each pouch is 10oz and fills one wine glass. I would say this is a single serving, 280 calories a bag I might add. We tried the Merlot flavor first mainly because that is our favorite wine. As the picture depicts, they are basically a wine slushy. It is definitely attractive in a glass. They seemed very syrupy to us, a little too sweet for our tastes. It does contain high fructose corn syrup, so if you have any preconceived notions of this than it may be a turn off as well. I love a frozen beverage, but not sure this is for us. We enjoy wine right out of the bottle or enhanced with fruit and some sparkling water. I am sure some will find these very refreshing especially on a hot day, it just was not our favorite. 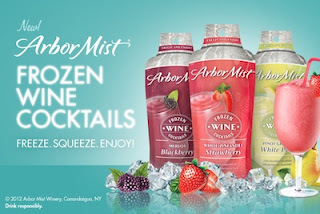 Blackberry Merlot: bursting with aromas of ripe blackberries and fresh guava, this naturally flavored frozen Merlot adds a new twist to the classic Arbor Mist wine. Strawberry White Zinfandel: redefined in this new spin on an Arbor Mist classic. Aromas of fresh-picked strawberries create an enticing bouquet that integrates perfect with this well-balanced and smooth, naturally flavored frozen wine. White Pear Pinot Grigio: Frozen White Pear Pinot Grigio is a true delight! Refreshingly smooth, this frozen wine has a taste that is rich with natural flavors of ripe pear and hints of apple and citrus. I was given these samples to review and was given no other compensation. All the opinions are my own.